Here is the long version, or "a" long version of my story, leading up to why I now consider myself a post-believer or a de facto atheist. Born into southern Christianity. Musical prodigy to whom the beautiful music of the church had great appeal. Add the conflict of being gay and you have the perfect mix for a suicide or drug addict. But I had enough choleric in me that I survived. I was a Southern Baptist nine months before I was born. Raised in the church, born again at age nine, "got serious about my relationship with Christ" during college. I spent ten years as an "ex-gay" just loving the Lord and waiting for God to "transform me by the renewing of my mind, yada, yada, yada." During that ten years, I was in the ministry doing music and sometimes, youth. 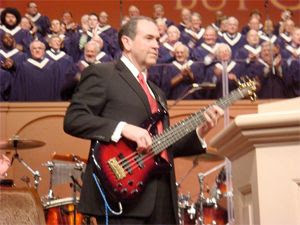 Two concerts at Falwell's church, concerts and evangelical meetings around the country. I have performed/ministered in the largest churches in America and dozens of the smallest. But after ten years, my desperate prayers were not being answered. I had a couple of relationships along the way but my melancholy temperament was killing me, torn between two lovers, one of which was the Lord Jesus. After ten years, I was mentally fried, my options were insanity (not crazy enough for that), suicide (too messy and painful for others) or just leaving the ministry and "coming out," whatever that meant. On March 17, 1982, I left the ministry in the middle of the night feeling like the scum of the earth, since I WAS an abomination to God, no matter how much I loved him and tried to live for him. I told no one, only left a couple of letters behind explaining how I was not able to reach the moral level needed for their ministry. I had been told homosexuals are an abomination to God, and since God did not "deliver me" from homosexuality as he did for the Corinthians, I could only assume that yes, I probably was an abomination to God. At 9pm, I drove from our ministry in Little Rock (of which Mike Huckabee was also a part) to Texas in the middle of the night, driving for six hours to get away. To make a long story shorter, I got involved with the local MCC church almost immediately and was labeled the "resident fundamentalist." That is when I was first shown that the scriptures do not always mean what my fundamentalist roots led me to believe. I went another eighteen years of studying the Bible, working in "straight" churches. I was often told by pastors and others how godly and wonderful I was, even being told by one pastor how I was "God's man for the job"...until they found out that I was actually "gay," or called myself that. At that point, I was usually kicked out the door immediately. The fact that I was single and celibate at the time was irrelevant to them. After twenty years or so, I looked back at some of the kids I had in past youth groups. I began to realize that the kids I had in youth groups twenty years before grew into adults who were just like they were as teenagers -- same personality, same quirks. I finally admitted that people don't really change much, no matter how we bang them over the head with the Bible and feed them pizza. This what another realization that caused me to question the virtue of the whole "Christianity thing." During my college years, I had a couple of good spiritual mentors who taught me how to read and study the Bible, using word-studies, Bible encyclopedias, multiple commentaries and other language study helps. I had always been a writer and never stopped writing Bible studies and lessons. I took some time and finally wrote the true story of Sodom and Gomorrah. At one point, I allowed it to be placed on-line on a gay, Christian web site. You had to really search for it; you didn't find it by accident. Well...ten years ago, someone at a church were I was serving as pianist/organist/orchestra director searched on the Internet and found it. And my immediate superior brought it to me and asked about it. So, I was again left outside in the parking lot of the church and again given the left fist of fellowship. Over the years, I had questions about Biblical inconsistencies and what looked to me like error or contradictions. Since "there are no contradictions in the Bible," I was very accepting of the rationalizations and justifications I was given for what I thought were obvious errors. After my final parking-lot experience over the S&G story, I had enough of it. I began to stop rationalizing my answers and seek out truth. I said "This isn't working, something is wrong here." So I started being honest with myself and realizing that the cliches and double-talk of my "Fundy" theology did not seriously answer anything. I already realized that I would probably eventually become what I called agnostic. But the more I asked serious questions and realized I was offered stale, old cliches (the same ones I quoted for decades,) the more "post-believer" I knew would be the inevitable end result. Evangelical/Fundamentalist Christian appologists often refuse to look honestly at the roots of their faith and how their contemporary belief system was developed. They see the Bible through their denominational eyes, then claim that they are seeing it correctly while "all those others" are misreading it. They know all truth and you do not! And they are proud of it. It has taken many years to accept reality instead of fairy tales. My sweet mother died five years ago and my wonderful and unique father died two years ago. I no longer have to keep up a facade just for them, although my Father would have accepted anything I said because he truly offered unconditional love. And I never heard him pray one time in my life or saw him open the Bible. Today, I consider myself a "de facto atheist" as Dawkins said. When I see Christians, I know they love me and I will be a part of their church family...until...they learn that I do not believe 100% as they believe. Unfortunately, I truly regret the decades I spent as a Christian. In my college years and after, I passed over many spectacular career moves because I did not think God would want me to take that job, to play that ungodly secular music, like Misty" or "I Left My Heart In San Fransisco" and those other many ungodly songs. What a simple-minded fool I was. I tried to stay "in the church" while the church people bashed me every time they had the chance. I put up with more abuse from ego-driven pastors and church leaders, not realizing that they were not leading the flock as much as running their little kingdoms and keeping their good jobs. I was quickly dispensable, especially when I stepped out of the box in any way. I still work at a church, but am looking forward to the time where the income from that little job is not needed. I see no reason to go to a watered-down bible club every Sunday, wearing a facade of conformity just to pray, knowing that I could achieve the same result by drinking water or painting a brick. As a musician, I work late and church is very early on Sunday morning. If they did not pay me, I would not be there or anywhere else until brunch about 1pm. I finally admitted that people don't really change much, no matter how we bang them over the head with the Bible and feed them pizza.I understand why some say one cannot completely discard everything that made you into the person you are today. But the truth is, I see church as a club. The local church has a president (the pastor), a governing board (elders or deacons,) regular club meetings, music and entertainment, good speakers, food and refreshments at certain club meetings...all the trappings and characteristics of the Lions Club or the Jaycees club or the local Garden Club or any other civic or hobby club. Even without church, my parents would have molded me by example, since they were by far the greatest influence on my life, far more than the arrogance and condescension I observed from many church people towards others who were not part of their "baptist club" or "Assembly of God Club" or "Church of Christ Club" or whatever name it uses. Instead of "winning souls to the Lord, they build a new church, a new club-building to give the illusion of spiritual activity. Instead of literally practicing the great commision and making disciples, they build softball teams and steal inactive members from other churches to show an increase in the numbers. I am tired of wasting my time on people who would practice their "unconditional love" by literally rejecting me if they knew what I believe. Why go to church?? Unless it is a source of income, why bother? At this point in my life, and with my past experience, I see little if any virtue in it. So you can consider me a post-believer.